« Daring Bakers’ Challenge September 2011 – Fresh, fluffy, french and completed! I have to say, I was pretty impressed with myself for making croissants. Stunned and amazed at my ability to produce half-arsed pastry items. It’s nice to have low standards sometimes. So the next weekend, faced with a group coming over for brunch and a 3rd birthday party, I made plans to make Christmas cake, gingerbread men and croissants, all using recipes from the Bourke Street Bakery Cookbook (which I love so much that half the pages are either stuck together with batter or stained with butter). I started making the croissant dough on Friday, set for guests arriving on Saturday morning. Then our smallest small person got sick so we postponed brunch, leaving me with a seriously massive quantity of dough and no obvious consumers. However, I decided to make the croissants anyway and try to find homes for them all. Honestly, my arms ached every time I took the dough out of the oven to roll and fold it. 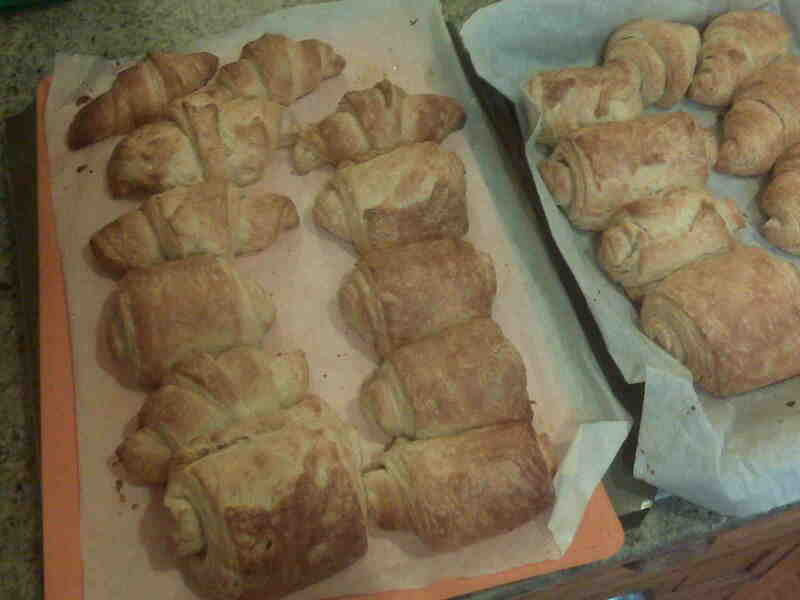 I think I ended up making 32 large plain and chocolate croissants. Unfortunately I only have a dodgy photo from my phone but they were quite tasty, from what I tried (I’m still not a major croissant eater so they mostly went to neighbours). I think they needed to be cooked for longer though. But so fun to make! And good exercise for my arms, which normally get neglected while I run everywhere. 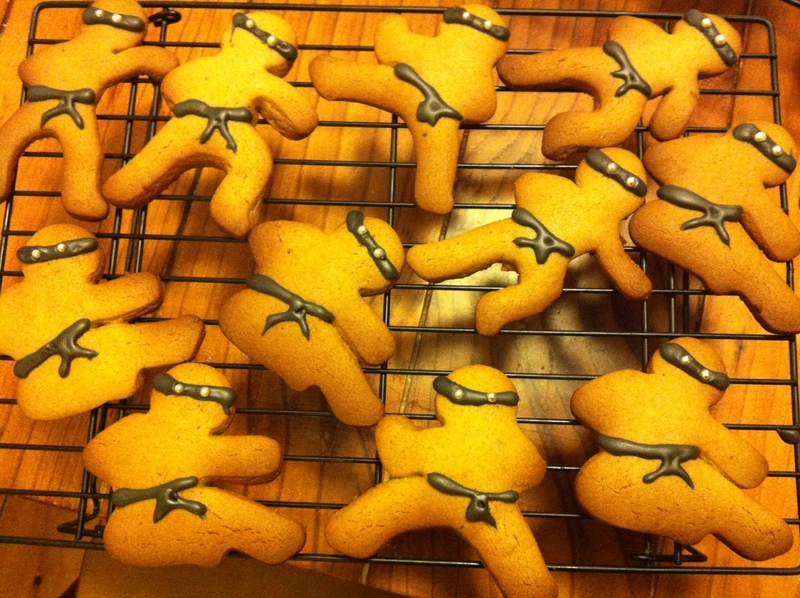 I then made a batch (which was actually a half batch) of gingerbread men, also from the BSB cookbook. I love this recipe as it is quite spicy and has real character to it. I have never made the full recipe as it would make hundreds (slight exaggeration possible) of biscuits. Here is the finished result. 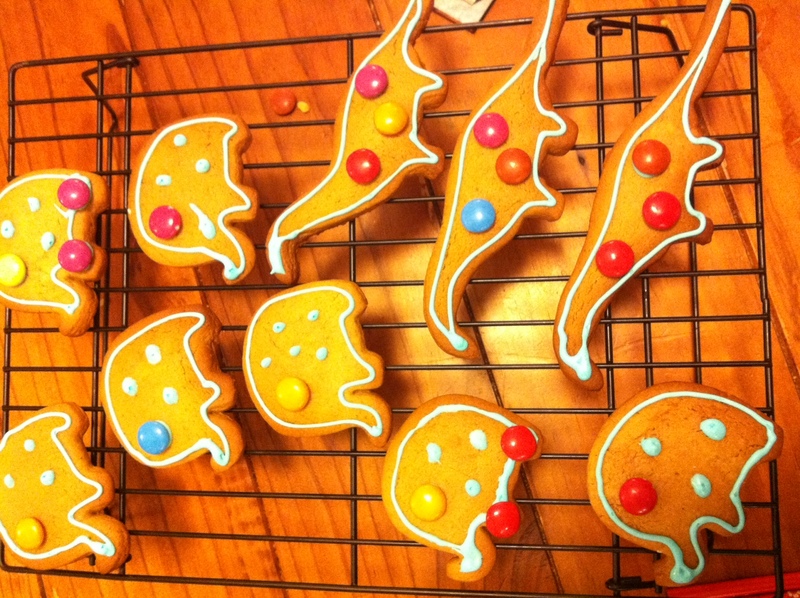 You will note that my icing skills have not improved significantly. The dinosaurs were the most popular biscuit of the 3 with the small boys, who ran around pretending to attack other children with them. I had forgotten though that what small children really like is icing, so there were a few sad, nibbled dinosaurs left over, bereft of their chocolate adornments. I also made 2 Christmas cakes, which I forgot to photograph. And then I had a nap. The ninja gingerbread men are adorable!